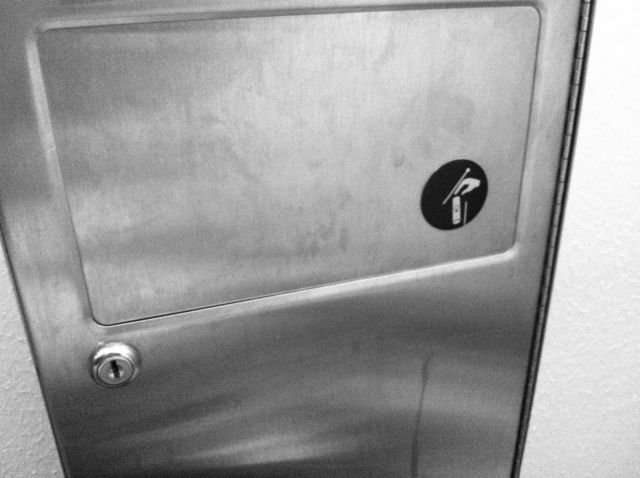 Why is there a lock on this used tampon bin? Anyone? Is there some kind of disgusting fetish I’m not aware of? I’ve read that anthropologists think that human beings had no concept of personal property until the agricultural revolution. Presumably that meant no one was able to keep all the used tampons to him- or herself. I keep thinking there might be a “good” reason to have a lock here. But every reason I can think of makes me despair for humanity.